As leaves fall from their trees, animals huddle against the cold, and frost creeps across windows, everyone knows—winter is on its way! Join a brother and sister as they explore nature and take a stroll through their twinkling town, greeting all the signs of the coming season. In a series of conversations with everything from the setting sun to curious deer, they say goodbye to autumn and welcome the glorious first snow of winter in Kenar Pak's Goodbye Autumn, Hello Winter. 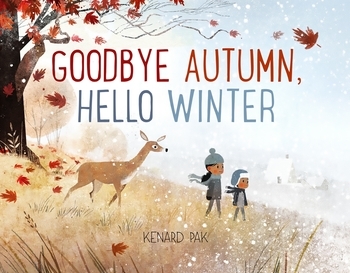 Kenard Pak is the author and illustrator of Goodbye Summer, Hello Autumn. Starting out as an artist with DreamWorks and Disney, Mr. Pak has also illustrated children’s books such as Have You Heard the Nesting Bird? by Rita Gray and The Dinner That Cooked Itself by J. C. Hsyu. He now lives in San Francisco with his wife and their three cats.